This review seeks to detail the clinical and pathologic features specific to BRAFV600E colorectal cancer. Application of novel preclinical findings translated into the clinic for the development of new therapeutic options for patients with BRAFV600E metastatic colorectal cancer will be detailed. While BRAF inhibitors as monotherapy do not have the same clinical activity for colorectal cancer relative to other solid tumors harboring an oncogenic BRAFV600E mutation, combination approaches targeting BRAF + MEK + EGFR hold promise for patients with BRAFV600E colorectal cancer. Simultaneous targeting of multiple drivers along the MAPK pathway improves clinical outcomes for patients with BRAFV600E colorectal cancer. Targeted therapies and immunotherapy hold great promise in the years to come for patients with this subtype of colorectal cancer. Network. NCC. 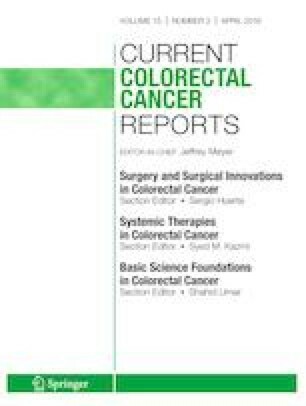 NCCN Guidelines Colon Cancer, version 4.2018. https://www.nccn.org/professionals/physician_gls/pdf/colon.pdf. Accessed 23 Oct 2018.